What does it take to attract media coverage? Lisa Brandt puts decades of experience choosing, booking and interviewing guests into this all meat, no-filler guide to what producers and hosts are looking for when the choose who to have on their radio and TV shows. (Print, too!) Included are real-life experiences of what works and what doesn’t when it comes to dealing with media pros. 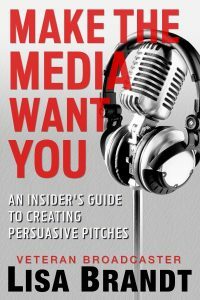 It’s concise and direct – just like your pitches to the media should be! Lisa Brandt is a longtime radio host, TV personality and columnist. She’s the author of four previous books including The Naked Truth, a memoir about the summer she worked at a nudist resort.